This tattooed islander, Prince Jeoly whose name is sometimes pronounced Giolo, is credited as being the first of a long line of tattoo attractions. He appeared in London in 1691 in the company of William Dampier. 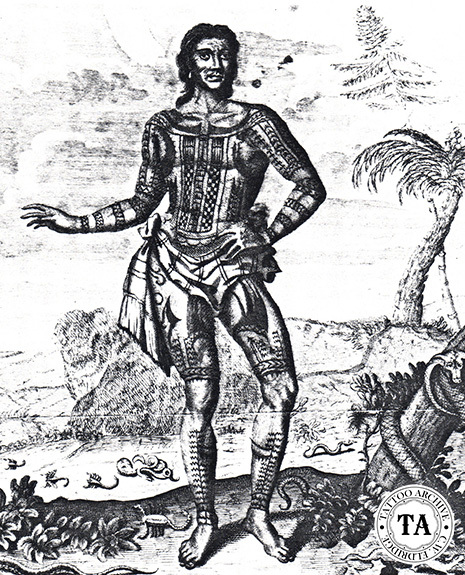 As interesting as the Jeoly story may be, it is overshadowed by the exploits of Dampier who was a self-styled buccaneer, naval officer, explorer and natural scientist. Dampier sailed around the world three times and was the first Englishman to visit Australia. Born in 1651 in Somerset county, England, Dampier was at sea by his 18th birthday and spent most of his life there finding fame and fortune. The year 1690 found Dampier on the west coast of Sumatra 12 years into a round-the-world voyage. Suffering from dysentery and malaria, his time had come to end his adventures and return home with his two surviving assets: his journal and his 'painted prince' Prince Jeoly. In his 1966 book William Dampier author Christopher Lloyd stated that Dampier was given Jeoly by a friendly sea captain. Jeoly was heavily tattooed in the fashion of the Philippines Islands, the likes of which had not been seen before. Prince Jeoly was taken "to be seen by some eminent person" who promptly bought a half share in the boy. Dampier was penniless upon his arrival in London and sold his share in the Prince as well. These keen new owners exhibited Jeoly until his death from smallpox a few months later in Oxford. Dampier went on to sail around the world twice more before his own death in 1715.